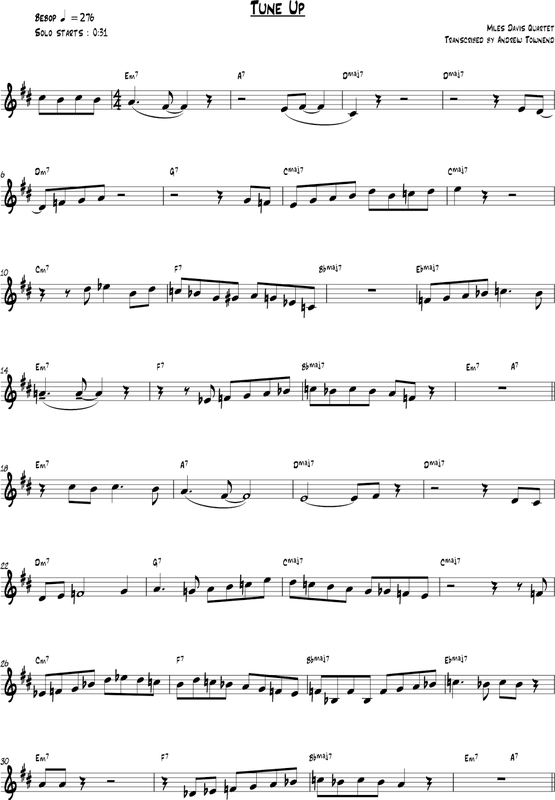 For your consideration, I'd like to present to you, my transcription of Tune Up by Miles Davis. This will be the first of a few of Miles Davis' songs transcribed here, I think the lyrical nature of them makes them great to play on the guitar so that's one reason, also I'd like to take a tour through some of the great man's back catalogue. According to his autobiography "Miles", he considers some of his most fertile creative periods as the years between 1954-60 and 1964-68. He certainly was not one to rest on his laurels so that'll make for some interesting studies between these two periods, the line-ups he put together reads like a whose who of jazz royalty and his music is well worth a listen. This one's taken from his album Blue Haze circa 1954 with some of his regular stalwarts like Gil Evans, Max Roach and Percy Heath all turning up for the session. It's a ii-V workout in D major.